Should the data warehouse be deployed on the cloud? IDC addresses this question on a regular basis. As adoption of cloud software increases, organizations of all sizes across industries and geographic regions are evaluating and assessing the opportunities and challenges of deploying software on the cloud. Data warehousing solutions are no exception to this trend. However, the question of whether to deploy any given data warehouse on the cloud masks two related questions, Does a data warehouse still matter?, What type of cloud deployment should be used for data warehousing? 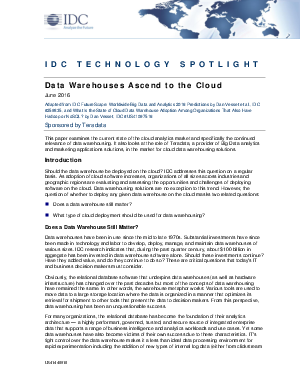 Read this IDC Research Spotlight to learn more.